Two first half penalties from Tom Potter gave Whitley a well deserved three points at Seaham Red Star and extended their unbeaten run to eight games. However, the victory was overshadowed by injuries to two key players, midfielder Thibault Charmey and goalkeeper Tom Flynn. Charmey’s injury was first thought to be a badly grazed shin but it was later diagnosed as a fractured fibula while Flynn had to be helped from the field with a hamstring problem. These are just the latest in a series of injuries that have hampered Whitley this season but on a positive note, apart from the win perhaps the most encouraging feature of the day was the impressive performance of young defender Noah Summers on his first team debut. Playing into the breeze in the first half, Whitley’s first clear chance came in the 15th minute when Scott Jasper and Kyle Patton combined to cut through the Seaham defence with Patton’s shot being diverted wide by the outstretched foot of goalkeeper Jordan Harkess. A minute later another Bay attack produced the breakthrough when Patton was tripped in the box by defender David Scorer and Tom Potter beat Harkess from the penalty spot. The action was coming thick and fast and when Whitley burst forward straight from the restart, Charmey went down on the edge of the 18 yard box under a heavy challenge. After lengthy treatment he was helped from the pitch, not aware at that stage of the seriousness of his injury. Shortly after play resumed with Peter Glen-Ravenhill replacing Charmey, Andy Johnston got a shot on target for the hosts but Flynn saved comfortably. An attempt from Alex Kempster was then deflected over the bar. There was a brief period of pressure from Red Star with former Bay winger Robbie Bird prominent but with Wilkinson and Summers dealing with the high balls, Whitley held out and ended the half the stronger. Three minutes before the interval Ross Wilkinson sent a header narrowly wide from Glen-Ravenhill’s free kick but then in the fourth minute of time added on for Charmey’s injury, Potter was tripped as he broke into the box. Kyle Patton struck the loose ball against the post but the referee had already blown for a penalty which Potter despatched into the top corner of the net to give Whitley a two goal lead at the interval. Six minutes into the second half, Jack Walker, playing against his former club, cleared Robbie Bird’s header off the line before going straight down the other end where he delivered a cross that was tipped over the bar by Harkess. From the corner that followed, Summers joined the attack and sent a header only inches over the bar. As the half progressed, chances were at a premium at both ends. Whitley looked comfortably in control of proceedings but could not get the third goal that would have put the outcome beyond doubt. Then with just five minutes remaining, Tom Flynn launched a long kick downfield but in doing so damaged his hamstring and fell to the ground in obvious pain. 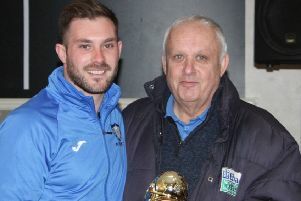 After a lengthy period of treatment, he was helped off the pitch and having used all of their three substitutes, Whitley were left to play out the remainder of the game with just ten men as Liam Brooks took over in goal. Seaham failed to test the emergency keeper and apart from an overhead kick from substitute Lee Hetherington which flew well wide, there was no threat to the Bay goal and they comfortably held on to record a well deserved victory. Injuries have stretched Whitley’s resources already this season and once again Marc Nash and his management team may look to the Reserve team to bolster their squad.